Dublin manager Mick Bohan with Cork manager Ephie Fitzgerald. ©INPHO/Tommy Dickson. 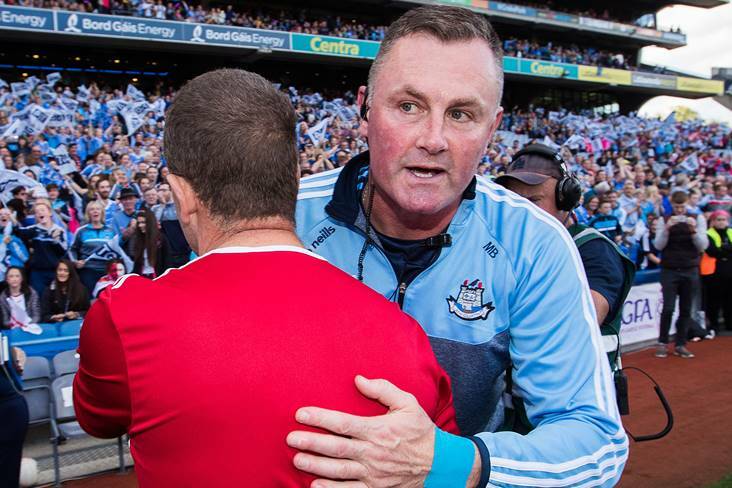 Mick Bohan says Dublin will be hurting after Cork avenged their All-Ireland final defeat in the final round of in Lidl NFL Division 1 games, but after the loss Dublin will get another crack at Cork in the semi-final in two weeks’ time. The other Division 1 semi-final sees Galway face Donegal, a repeat of Sunday’s meeting of the sides, which ended in a convincing win for Tim Rabbitte’s side in Corofin. Goals from captain Tracey Leonard and her cousin Roisin Leonard helped Galway to a sixth win from seven games in the competition, but the Galway manager says his side have plenty to improve on ahead of the next meeting. “It was unusual circumstance going into the game. We knew if we won we’d be playing Donegal again and that’s the way it is. I thought there was a small bit of shadow-boxing going on but not really on our part, we just went out to win the game,” said Rabbitte. Carla Rowe and Siobhan Killeen bagged the goals for Bohan’s side, but they were second best on the day and fell to their second loss of the competition. “They were missing a number of players, but I am delighted with the performance of our younger girls and this league has been very good for us in finding a number of new players,” said Fitzgerald. Mick Bohan admitted his side were bruised after their second loss of the league. “It was a good chance for some of our players to test themselves against one of the top sides in the country,” said Bohan. In the other Division 1 games Westmeath ran out confident winners at home to Tipperary thanks to two goals from Leanne Slevin in Kinnegad. Orla O’Dwyer bagged two of her own for Tipperary, but Westmeath ran riot late on as goals from Kelly Boyce Jordan, Vicky Carr and Annie Dolan wrapped up their second win of the competition. And in the last game played on Sunday, already relegated Monaghan were unable to hold on to a 12-point lead as late goals from subs Sarah Rowe and Natasha Gaughan earned Mayo a share of the spoils. Muireann Atkinson and Aoife McAnespie had found the net for Monaghan early on in a game that switched to the Monaghan Entekra Centre of Excellence, but Mayo’s brave fightback gave them a deserved point from their trip to Ulster. Meanwhile in Division 2 of the Lidl NFL there were wins for Tyrone over Kerry, for Clare against Waterford, Armagh defeated Wexford, while Cavan got the better of relegated Laois. A win for Cavan will see both teams qualify, even though Clare and Kerry would be level on points. The Round 1 clash of Clare and Kerry ended in a draw, but Kerry would qualify by virtue of the greater number of points they kicked in that game. Matters are a lot clearer in Division 3 where all games have been completed. After wins for Roscommon, Sligo, Longford and Down, the semi-finals in two weeks’ time will be Meath versus Longford and Sligo versus Roscommon. Offaly have been relegated.